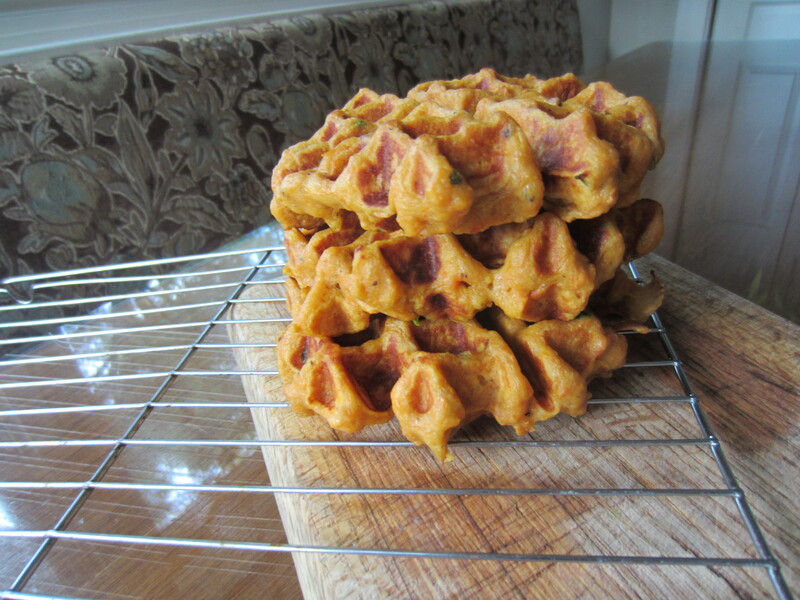 Mashed and sweetened sweet potato is the base for these slightly savory waffles. These work for breakfast or brunch or really any meal, they’re that good. Add buttermilk, cheddar, and finely chopped chives to a basic waffle recipe and stick them in a waffle maker. Take it easy when you’re pouring, these look cool as frayed circles. Adapted from Joy the Baker, my one true true love. Melt the butter in a saucepan over low heat until it begins to crackle and brown and smell nutty. Pour it into a medium bowl and whisk in the buttermilk and eggs. Add the mashed potatoes and however many chives you would like. Do not overmix! In a separate bowl, whisk the next five ingredients together. Add the dry ingredients to the wet, mixing until just moistened. Heat a waffle iron and grease if necessary. Dollop batter into the middle of the iron and cook until golden brown. Arrange cooked waffles on a baking sheet and sprinkle with cheese, broil just until the cheese is melted and bubbly. Sprinkle with some more chives and serve warm.